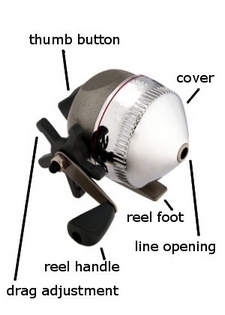 The spincast reel is an attempt to solve the problem of backlash found in baitcast designs, while reducing line twist and snare complaints sometimes encountered with traditional spinning reel designs. Just as with the spinning reel, the line is thrown from a fixed spool and can therefore be used with relatively light lures and baits. However, the spincast reel eliminates the large wire bail and line roller of the spinning reel in favor of one or two simple pickup pins and a metal cup to wind the line on the spool. Traditionally mounted above the rod, the spincast reel is also fitted with an external nose cone that encloses and protects the fixed spool.